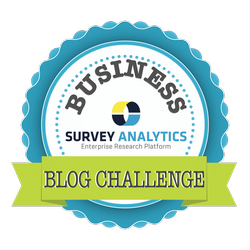 SurveyAnalytics Blog: Day 11: Where Do Your Customers Come From? The first step to tackling customer acquisition is not only to have a few customers, but to know why they became customers. It doesn't just stop at being a customer, either. We continue to pull our strengths to continue developing the platform you rely on. We even throw in some blue sky ideas here and there to try out something new where we believe efficiency can be improved. We already know that we can see it, and we want to help you see it too. We want to grow together. Organically. Believe it or not, majority of the time Survey Analytics has been around, there was not even a marketing team or involvement with public relations. We still found customers. Customers still found us. We still experienced exponential growth for being a private owned software company. Perception is king. How you see our software being used is only the beginning of what we can do. We rely heavily on being personable and helpful while acquiring and retaining our customers. Our mission and vision is to meet the needs and develop what our customers need to make their lives easier! We are not an out of the box "one size fits all" solution. We are applied in many different ways in over 30 industries. Being that we run on an agile development cycle, you may not have to wait long at all for some enhancements. So how exactly and where exactly do majority of Survey Analytics customers come from? Continue reading to see eight special secrets to our success in acquiring customers. From the roots of our organization, we really do want to help others. We want to combine our strengths of development and technology with your strengths working in the field. In the very beginning, our first customers came from personally reaching out within our own connections as online surveys began to boom in the early 00s. Read the story about our very first customer here. Still today, we reach out and make personal suggestions and new connections, build a two way stream of communication and trust that converts into customers. We have many prospects that come in that want something even more advanced than what we have out in our latest product release today. In these situations, we are happy to build out a roadmap and develop something for you to get by while we work on delivering the big picture. More often than not through great communication and listening, we are able to deliver something even better than what you may have expected. A great example of this would be the recent logic enhancements we have been making to make everything from branching, skip logic, piping, mapping and scripting more smooth. Today's consumers are becoming increasingly more knowledgeable and savvy about how everything works together. Information is now accessible to us all. We are learning how to apply this information in every aspect of our lives. We have arrived in an era of testing before we buy things. A lot of organizations have made large and hopeful investments that just didn't add up. To get things off on a solid ground, we offer a variety of pilot programs so you don't get screwed, and these pilot programs hold us accountable to deliver exactly what you need to be more efficient. We have quite a few strong partnerships in place, and they can vary depending on the size of the organization that partnership is with. In an SMB or non-profit organization, our partnership is often utilized to help them get more bang for the buck, make more money and justify the value/ROI of the software. In a large organization, our partnerships do not always tie down to the dollar, but to efficiency and trying new, faster methods to gather the same information. We understand and emphasize that our software can make or break someones role. That's why we added a team of field experts, the Customer Success Team, to make sure that everything goes smooth. Security is important to everyone. A security breach can cost people and organizations both a lot of money and a lot of operation hours to recover from. When dealing with personal data and proprietary information, security becomes even more important. There are no shortcuts in security and compliance, and security is something we heavily focus on. Some of our customers come to us because we are one of two to three providers that actually meet their enforced security requirements. We are secure and in compliance with SOC-2, PCI DSS, CloudFlare and even have an 853-a low risk certification to work within the U.S. Government. We offer things like a 7 day free trial to dip your feet in the water before diving in. It's great to just explore some of the basic functionality of our platform. We also get great feedback from this initiative on the user experience, where we stand, what is powerful and what needs worked on, too! Aside from a free trial service, which most software companies do, we also give away something big every once in awhile. Check out or Research App Giveaway running this month where we are giving away something as BIG as a fully white labeled iOS and Android app to one lucky random selected winner and helping them along the way to succeed in the real world application. Webinars are crucial to our customer acquisition strategy and a great offering to spotlight and share some of the things we learn. It is really powerful when someone gives you an hour of their time to see what you have or listen to your story. Webinars are great for moving the funnel and even sparking a new opportunity from someone that was previously unqualified or uninterested. Collecting ongoing feedback from your webinar audience is important, too. See some of our webinars right here on the blog by clicking the webinars tab. The landscape of SEO as we once knew it has changed significantly over the two years. Like mentioned earlier about security, we do not take shortcuts in this department, either. We are both surprised and happy to see that some relevant and helpful FAQs, Feature Spotlights and Q&As right here on our blog have been converting new deals over the past year. There's no funnel, no pitch, no bragbook or gloat happening here. It's true that content without conversion is just free publishing, but some of what we have been sharing has been helpful after all! Just like any other channel, with digital and content marketing, there are no shortcuts, you get what you put in.